Downtown State College celebrated Military Appreciation on November 2nd during the monthly First Friday event. 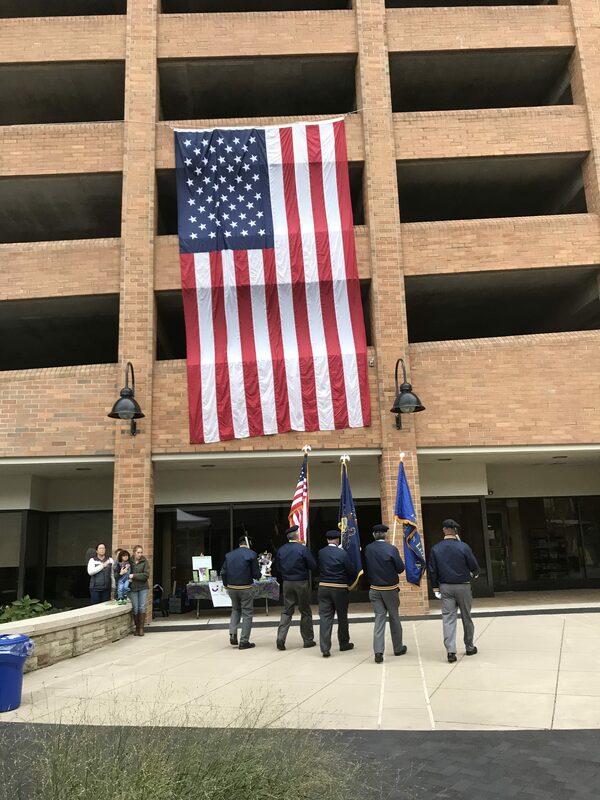 State College donned an array of military memorabilia and patriotic regalia as the American flag flew high from the Fraser Deck and military vehicles lined the street. The event started with the presentation of colors by American Legion Post #245 Honor Guard and the National Anthem sung by local musician and veteran, Sergeant Bob Timney. Free cupcakes and patriotic glow sticks were available at the Downtown State College booth, where attendees could also enter a raffle for four Penn State Football tickets and two pieces of Penn State Football memorabilia. The celebration continued with performances by barbershop a capella group, the Nittany Nights and informational booths, featuring local military organizations. Various downtown businesses also pledged their support, offering generous donations in support for the Penn State Student Military Fund. Beyond Fraser Street, businesses showcased artwork and entertainment throughout Downtown State College. This month Saint’s Cafe, McLanahan’s Market and Harper’s joined the First Friday action with live music performances. Appalachian Outdoors held their monthly silent auction and featured presentations at the KidTech’s STEM table, where children could build and launch paper airplanes. The Explore More Store, location inside Kish Bank and The Downtown Art Alliance featured unique art displays for the public to enjoy along with refreshments. The Makery and Woskob Family Gallery offered crafts and activities for children and families to enjoy and explore their inner art skills. This month’s event saw great support and engagement from the downtown businesses as well as residents and visitors. Thank you to all those who participated and enjoyed learning more about local military organizations and efforts. We are thankful for the support from our local community and encourage members to take advantage of all the events and special deals throughout Downtown State College. If you were unable to attend the Military Appreciation First Friday, take a look at our highlight video from the special event. We look forward to seeing you at our next First Friday on December 7.